As Mars pushes ahead in the freedom loving sign of Aquarius right now, it is expressing fully through Jada's Mars. Check out this video to see Mars in Aquarius in action! I am envisioning humanity becoming one with Jada's dancing, as she embodies this energy of Mars in the social sign of community. We are all taking action from this independent, yet socially minded place right now. At its highest manifestation, our collective physical energy is directed towards connecting with all beings as equals. Yes, let's do it! The love between these two is so beautiful to witness. They are an example of "the sun isn't everything" in astrology. His Sun is in Libra and her Sun is in Virgo, but they have so many other incredible connections together. Their first beautiful connection is that they have the same Venus! Hooray! They both have Venus in Libra! They are The Prince and The Princess! This is a wide conjunction, but in the same sign, they have the same ideals in relationships. Both with Venus in an air sign puts these two on Team Freedom, so they both innately understand the other's essential desire for autonomy. Moving on to the emotional connection, Jada's Virgo Moon, The Perfectionist, happily harmonizes in a sextile with Will's Scorpio Moon, The Extremist. I personally feel these two Moons have a super special connection. A yin to yin Moon will always be a harmonious connection, but I see something special about the Virgo Moon and the Scorpio Moon connection. The Virgo Moon provides the fertile earth and just enough stability for the intense Scorpio Moon water to feel truly safe in. If the Virgo Moon can set aside their judgements of their partner, the Scorpio Moon can feel an acceptance like no other and will fiercely commit their fixed waterfall to that Virgo tree. In its highest expression it is mututal symbiosis. So, point is, Will has a super intense emotional commitment to Jada. Jada has an equally intense aspect to her Venus which creates the deepest level of commitment. Her Venus is conjunct (in the same place with) Pluto, which loves to the death. So, they both share this intense way of commiting as well as the conflicting internal desire for autonomy and independence. Their connection reminds me a bit of Beyonce and Jay Z who both have the same deep desire for intense commitment and also complete freedom at the same time. Which is why they are so great together. Both pairs! Here's more of the freedom story. Jada has Mars in Aquarius, Ms Cool, and this along with her Venus in Libra means she plays solely on Team Freedom. Will's Venus in Libra harmonizes in a trine to her Mars in Aquarius, which creates an easy physical chemistry. She may play "the man" more than he does. 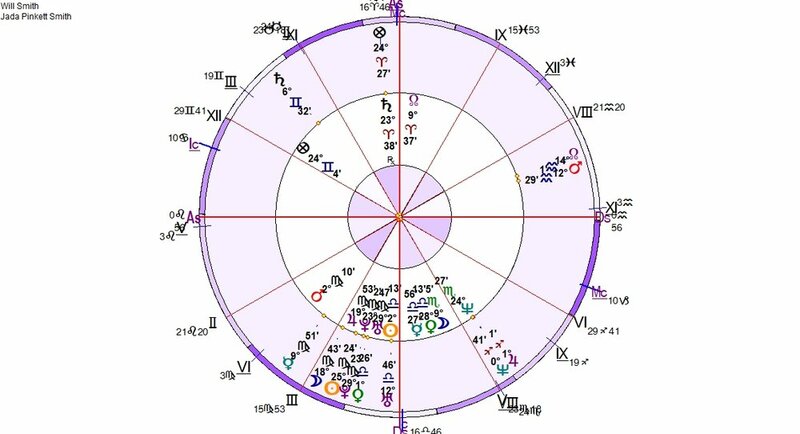 Will's Mars is in Virgo, The Fixer, doesn't connect with Jada's Venus or Mars, but does provide more connection and similarities for them because her Sun and Moon are in Virgo too. Will plays on Team Freedom and Team Practical. "20 Years Ago Today we held hands and walked naively down that aisle. Here’s what I’ve learned since. Happy Anniversary, My Queen! I am forever Devoted to Nurturing your Deepest Truth."